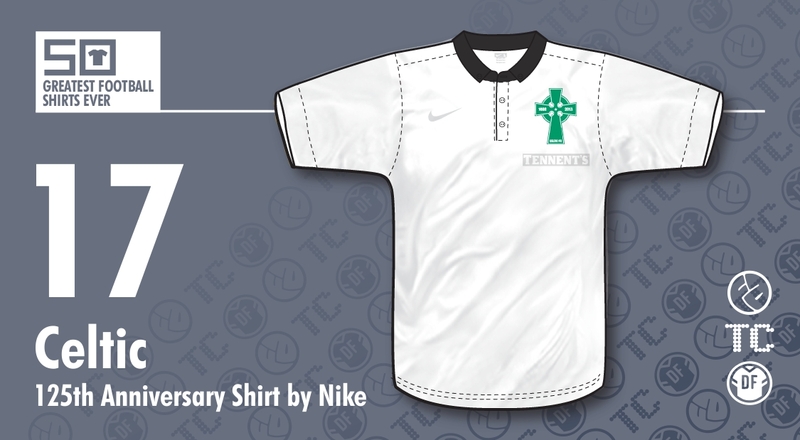 There are many ways to commemorate an anniversary with shirts; some good, some bad. Celtic's last major anniversary was their centenary in the 1987/88 season, which they celebrated in the typical fashion of the time - adding some wording under or around the crest. Celtic went one better and reverted to their original crest for the season, but that was it. No special shirt, no great pomp and ceremony, or marketing BS... Just a classy shirt with some wording and it worked perfectly. It was classy at the time and even today looks fantastic. So, 25 years later and with the next major milestone looming, what to do? The world had changed and with special edition shirts being released almost every day celebrating such mundane things as when some bloke off a student's t-shirt dropped by your place 50 years ago, the big question was how to mark the occasion? Celtic's answer? Create one of the classiest special edition shirts ever! For a start, they replicated the centenary shirt by having a special crest for the home shirt, but this time round they created a special Third shirt as well. What they came up with was a replica of what they wore the first time they played their Auld Firm rivals, Rangers, from May 1888. The kit as a whole was beautiful, with black shorts and green and black hooped socks, but this isn't about the kit as a whole, this is just about shirts... So could the jersey stand on its own? By god yes! The shirt itself was all white, topped off with a small, black collar so we're starting with a minimalist cool look already, but what really makes this shirt special are two subtle details. As with the 87/88 shirt, they changed their badge to their original Celtic cross, albeit in updated form, but it's what's beneath the crest that tops this shirt off nicely. Sponsors logos are a touchy subject on shirts these days, so when it comes to an anniversary edition, how would such a classy, retro looking shirt look with 'Tennents' sprawled across it? This problem was solved beautifully by the lager manufacturer allowing their logo to be rendered in white, subtly outlined in grey, and in a small version, just below the badge. This was a classy move by Tennents, which showed smart thinking. 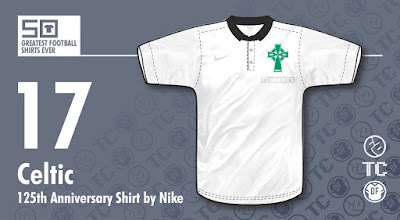 They didn't ruin the shirt and would no doubt have won people over by not doing so, Nike followed suit and the swoosh also appeared in white, leaving what appeared to be a retro-styled shirt bereft of logos of any kind. I don't think there's been a classier anniversary shirt. As a side note, Rangers, themselves sponsored by Tennents, also had the sponsor logo in the same size and placing, so as not to create any imbalance across the divide.